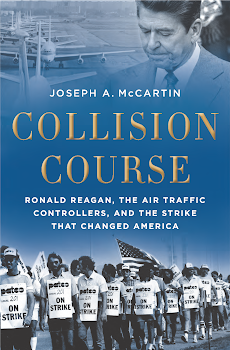 Thanks to a post by Pat Vaughan, I've learned of set of videos that do a wonderful job of explaining something that was challenging to get across through mere prose in my book: how air traffic control worked on the eve of the 1981 strike. These videos are from a story for the Sunday Magazine show on WKYC broadcast less than a year before the strike. Reporter Tom Haley journeyed to the Cleveland Air Route Traffic Control Center in Oberlin, Ohio, where he was given a tour by controller Dan Smith. Al Roker, then early in his broadcasting career, does the lead-in. The video comes in two parts. Enjoy.